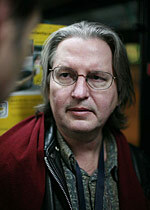 Bruce Sterling is the author of the nonfiction book The Hacker Crackdown, as well as the novels Distraction, Holy Fire, Heavy Weather, Schismatrix, and Islands in the Net. With William Gibson he co-authored the acclaimed novel The Difference Engine. He also writes for popular science and travel journals. He lives with his wife and two daughters in Austin, Texas.